In my memories, I always picture Grandma wearing an apron, whether doing housework, gardening, or baking coffee cake in her kitchen. Maybe that is part of the magic I feel when I put on my weaving apron. Weaving apron is ready for my next session at the Glimåkra Standard loom. Fabric protection board protects the fabric on the loom, but without an apron my clothing suffers from rubbing up against the board. I sit right up to the breast beam when I weave, which helps my posture and my reach. This makes the fabric on the loom vulnerable, especially to buttons, buckles, or zippers. It also gives my clothes undue wear, even creating small holes in some of my shirts. 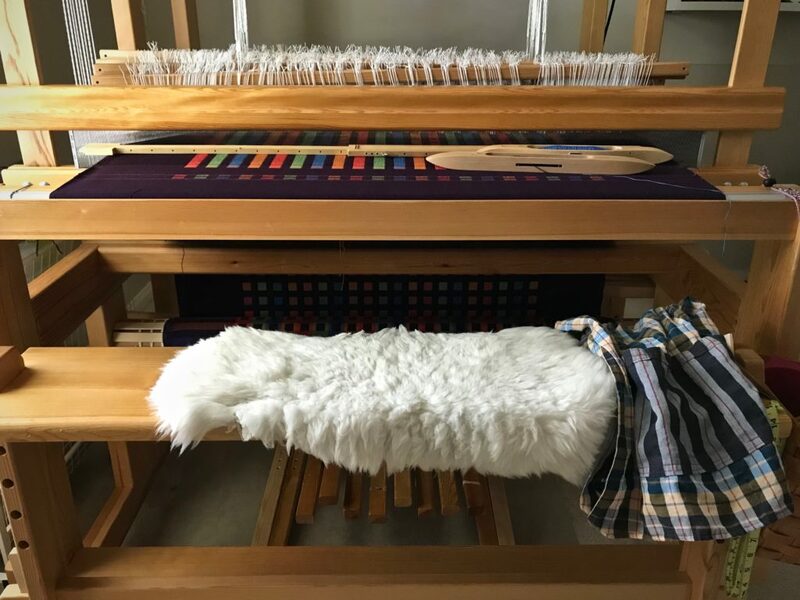 My Glimåkra Standard loom has the fabric protection board, aka “belly board,” but that is not in place until the knots from the beginning of the warp go under the breast beam. So, the first inches of weaving go unprotected. My other looms don’t have a fabric protection board. Apron is kept on the loom bench for easy access. 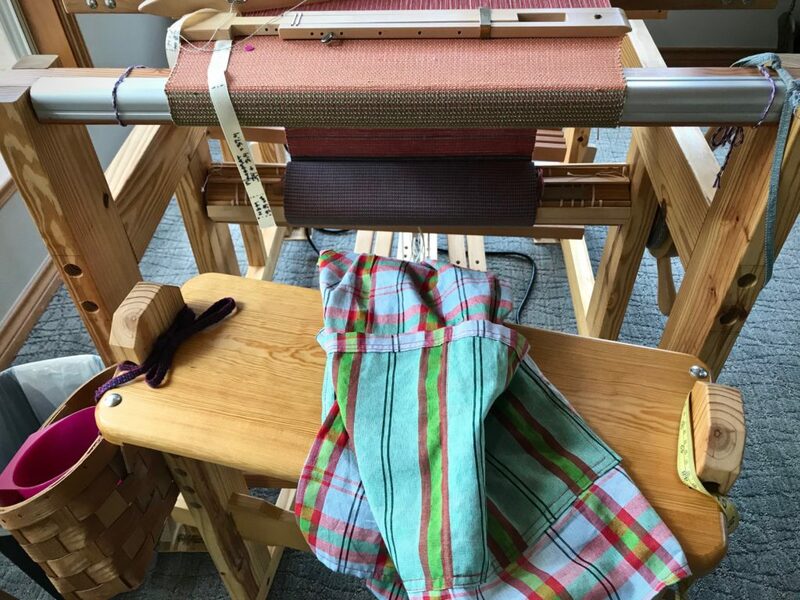 There is no fabric protection board on this loom, so without an apron, the tapestry being woven and the clothing I wear are both susceptible to damage from repeated contact. Apron pockets keep things handy. With simple criss-cross straps at the back, this weaving apron fits just about anybody. And there is no bow to tie in the back, like my Grandma’s aprons had. 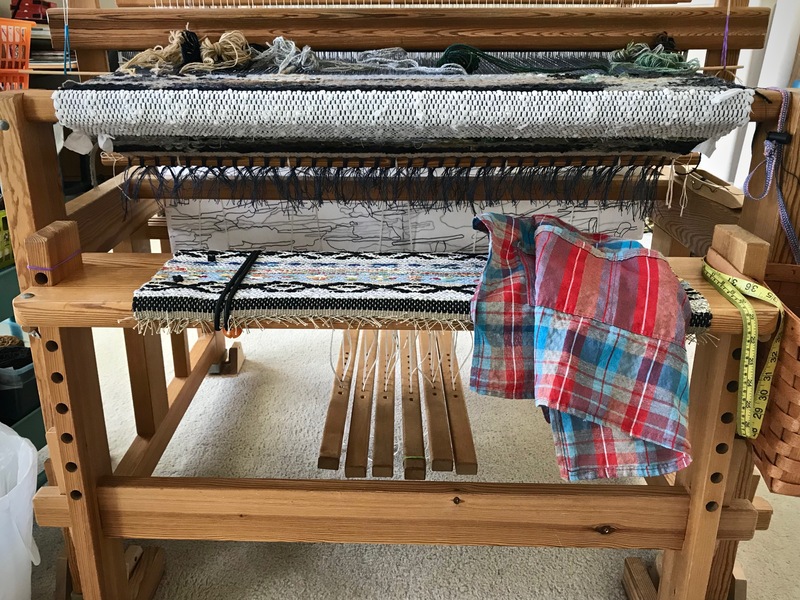 A weaving apron guards both the fabric on the loom and my clothes. 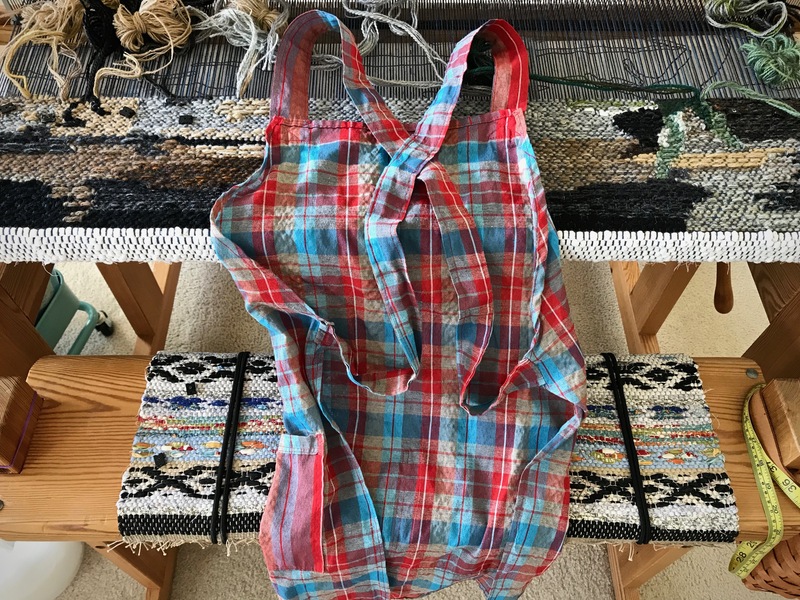 The apron also gives me ample pockets, good for countless things—dropping in a few wound quills to take back to the loom, keeping a tape measure handy, separating one wool butterfly from the rest, and other things you wouldn’t think of if you didn’t have them. Texas hill country loom has its weaving apron ready for my next visit there. May you have ample pockets. Fun! And of course it would be fun to weave the fabric to make one, if the current ones wear out. Hi Julia, Absolutely! I thought the same thing. Hi Joyce, The shop is (link:) The Elephant Story in Comfort, Texas. I don’t see the aprons on the website, but you can check it out. Thanks for the post! I’ve been considering buying or weaving myself a weaving apron and you have inspired me! I recently began wearing an apron again to cook. I don’t know why I never did once I left home so many decades ago! But it really saves on the splatter stains, especially grease, that I get on my clothes while cooking. AND with weaving I am enamored with the pockets! My “new to me” little Baby Wolf loom doesn’t have a castle or a bench with pockets on the sides like my Schacht Standard loom has. Pockets would really help! Hi Cindy, Your sweet encouragement means so much to me! 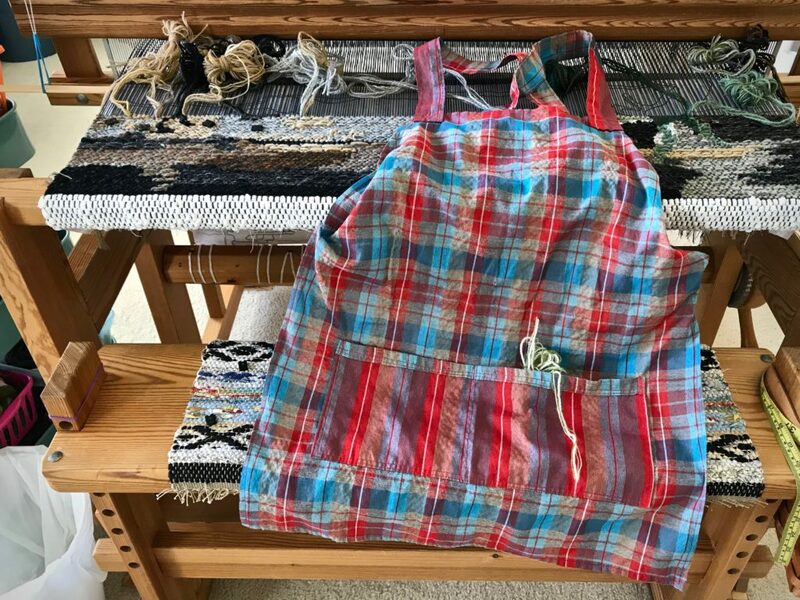 Yes, the pockets sold me on these aprons I use for weaving. It’s so great to have a place for those little things when I need them.